Don't bother buying those kits located near the bananas in your local grocery store. This recipe is way too easy to make to waste your money on a mix. Just buy a bag of popsicle sticks and keep them on hand for when you have extra ripe bananas. Cut bananas in half and insert the popsicle sticks into the bottoms until they feel secure. Place on a cookie sheet covered in parchment paper and stick in the freezer until frozen. If using, place the peanuts or sprinkles on a plate and set aside. Warm the chocolate and shortening in the microwave and heat on high in thirty second increments stirring at every stop until melted and workable. Place the chocolate in a wide glass or measuring cup and spoon the chocolate over the top of the banana, then roll the chocolate up the side and the banana around until covered. Quickly roll in the peanuts or sprinkles. Place back on the parchment covered cookie sheet and put back into the freezer. Store in a covered container between sheets of wax paper. Notes: To adjust chocolate proportions, melt 1 Tablespoon shortening with every 1 cup of chopped chocolate. I'd like to add a couple of tips to this recipe that I've learned from experience. First, it's really important to let your... bananas ripen until they are covered with *small* brown spots. That ensures that their sugar level is optimal. Next, when you freeze them, do not place them in a freezer bag. Moisture that evaporates from the bananas as they freeze will result in ice crystals on the bananas if it is trapped within a plastic bag. This ice will melt into the chocolate when you dip the bananas and cause the chocolate clump. If you do see ice crystals on the frozen bananas, brush it off prior to dipping them. 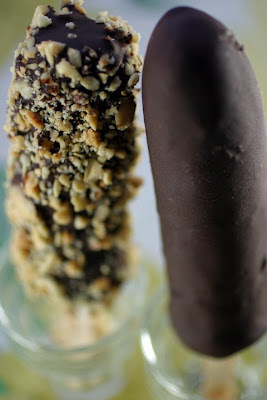 In addition to being a great tasting treat, frozen bananas are also a good food source. For a good description of nutritional benefits, see: http://www.totally-bananas.net. Thank-you Chuck! Those tips are much appreciated. oh! bananas and chocolate...perfect match!